Bloomberg reports that Bernard Kerik, the former police commissioner under New York City Mayor Rudolph Giuliani who withdrew his nomination to head the Department of Homeland Security, has been charged with fraud, tax evasion and conspiracy. Kerik once led the largest U.S. police department. 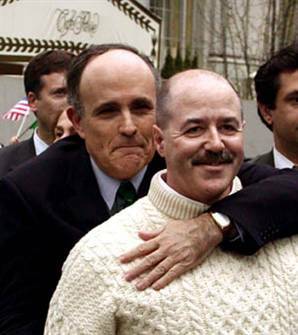 Giuliani – who’s currently seeking the Republican nomination for president – appointed Kerik police commissioner in 2000 and endorsed his 2004 nomination to head the U.S. Department of Homeland Security. Days after President George W. Bush introduced Kerik as his nominee, however, Kerik announced he was withdrawing his name because of tax issues involving his former nanny. If convicted, Kerik could face up to 142 years in prison and US$4.75 million in penalties. Good God another nannygate victim. I’ve lost track of how many senior nominees have gone down in flames over the years because of nanny problems. Doesn’t anyone in America has a legal nanny? While he’s fighting the charges by the sounds of it, allegedly they include mail and wire fraud, tax fraud, making false statements on a bank application, making false statements for a U.S. government position and theft of honest services.